For some reason in 1997 Keith Bontrager decided to dabble in BMX-in Santa Cruz NOT the crappy Trek BMX's that were Bonty branded! Two frame styles were made, the Warthog freestyle frame and the Diesel racer. I was told (by Keith) that the Warthog was designed by and built for Ryan Nyquist who promptly signed for Haro after the prototypes were built! So 7 Warthogs were made, this being no.2. I rode this bike for 2 years before I bent the forks and, as it's 1" and forks were hard to come by, I stripped it and put it in my uncles shed where it lay forgotten up until last week. It's long for a BMX, 21.25" top tube abd 14-15" back end. In 1998 I went to a book signing by Dave Prowse AKA DarthVader who siged the frame for me, the signature is still visible! The question is what to do....sell it to a Bonty collector who will look after it or stick it back in the shed ? It's tempting but I have too much on the go already mate. Search your feelings for the answer. Ceased to be : Dynatech MT3, killed by corroded seatstays. Yer Power b'roight Weak, Old Maan- Oi'll tek yon Loightzaber an' Stick it Up Thy Bum! May the forks be with you. Trek era Bontrager, could it really be worth much? Strange comment, obviously you didn't see the 'Made In Santa Cruz' decal or read the 'NOT Trek' part....this frame has NOTHING to do with Trek. It was hand made in California at Bontragers old facility. This is a Santa Cruz built 20" frame.As far as I know Bontrager never made forks in-house.There is no serial number because it is a prototype/team issue frame.The tubes were cut down from a 26" frame to the proper dimensions.This is not a Warthog!!! 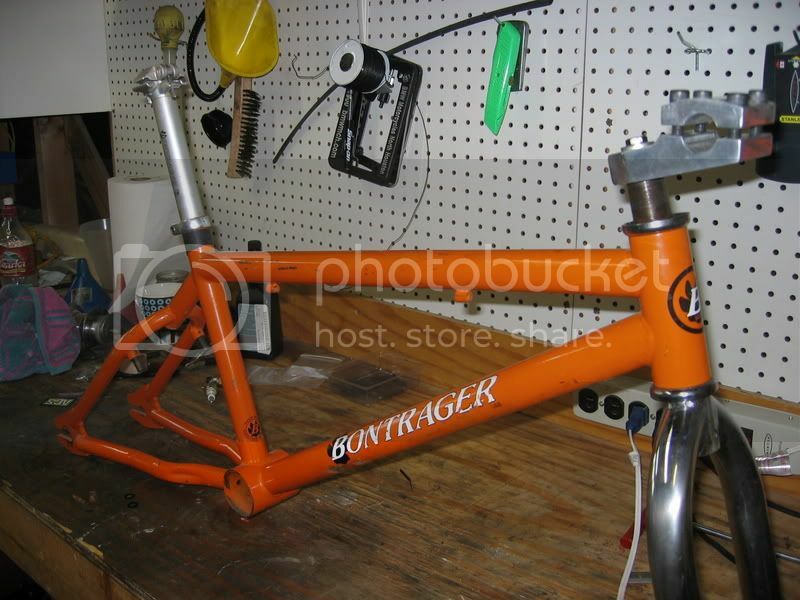 This is a real Bontrager BMX not a Trek. It is probably the best handling bike I ever rode.It was made for dirt jumping and street and held up great and was way lighter than everything out at the time.I got it in about 1993 or 1994. Well, that's 2 out of the 7 accounted for! Does anywhere still offer steerer press services?